This is a simple write-up so I don’t have to figure it out again next time. The goal is to setup a periodic timer which starts an ADC measurement on the background using DMA. I’m using a NUCLEO-F303RE development board. The STM32F303RE is configured to put 72MHz at TIM4. To generate events at 10Hz, a prescaler of 7200-1 is used with a counter period of 1000-1. After the prescaler, the frequency is 10kHz. The counter reaches 1000 after 0.1 second, after which the value is reloaded. An important setting here is the “Trigger Event Selection TRGO: Update Event”. This will be used to trigger the ADC. 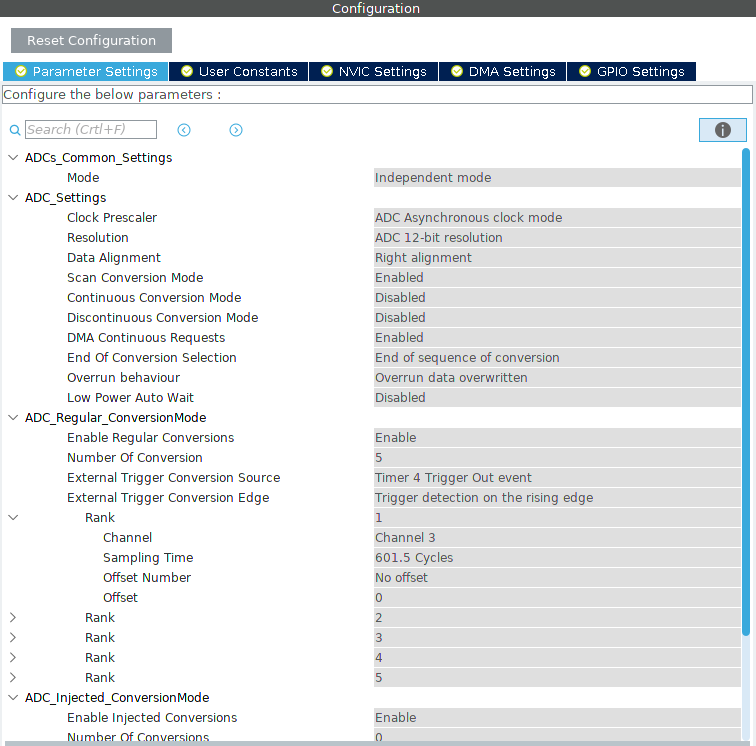 I have selected 5 channels (IN3 – IN7) on ADC2 which should all be measured in one go. 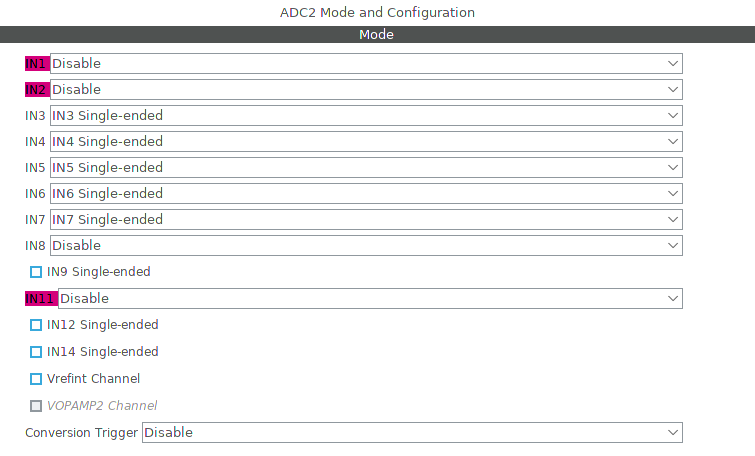 In the ADC configuration, I use 12-bit resolution. DMA Continuous Requests is enabled, because otherwise it will only measure on the first trigger from the timer. The number of conversions is set to 5, because I am measuring 5 channels. Each channels is configured individually in the ‘Rank’-dropdown. 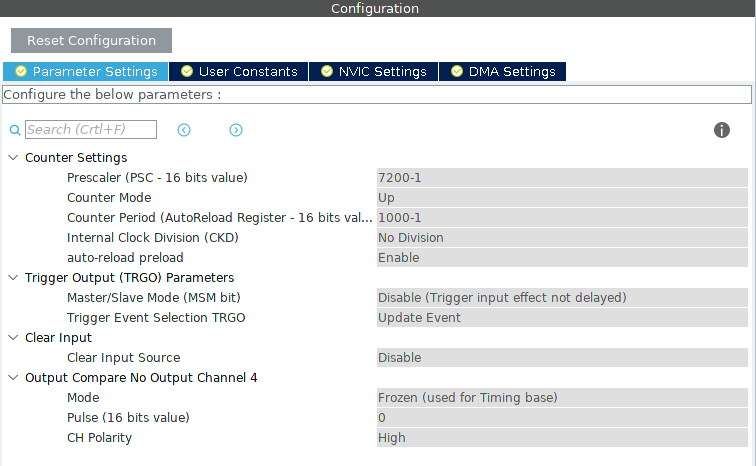 The External Trigger Conversion Source is set to “Timer 4 Trigger Out Event”, which corresponds to the previously mentioned timer configuration. This way, the ADC will be started every 0.1 seconds. To do this using DMA, the DMA is configured as follows. Data Width is chosen Half Word (16-bits), since the ADC is configured at 12-bit. Mode Circular is enabled because otherwise only one measurement will be done. Values of the previous measurement are overwritten.